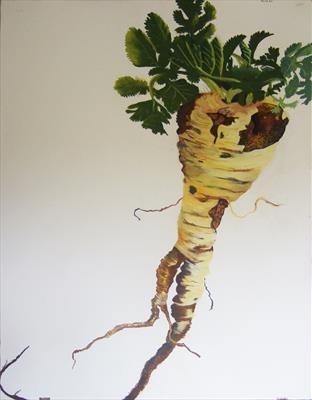 Tender and True - an old well loved variety of parsnip drawn in soft pastel on Somerset paper. This Tender and True parsnip is another in the series of vegetable portraits drawn from Susan's own garden and allotment. The artist has depicted each one against a plain background to show them as unique organisms with their own blemishes, spots and faults. Like people, the vegetable world is made up of exceptional individuals.